With the growth of digital data and the ever-growing tools to analyse it, it has resulted in a budding interest in the quite recent field of ‘Data Science’. An eclectic selection of organisations have begun to turn to these ‘Data Scientists’ in order to translate different amounts of data into insights which could potentially aid in business value. However, it bares a lot of resemblance to the pre-existing role of a ‘Business Intelligence Analyst’, with both trying to reach the same end goal. However, a data scientist can be described as having a more refined approach when it comes to handling data and are also more likely to have a set amount of skills which can better aid them when doing their job. In this short infographic we aim to outline only some of the differences between the two roles, and it can be seen that both hold quite strong similarities, but are also different in their own right. 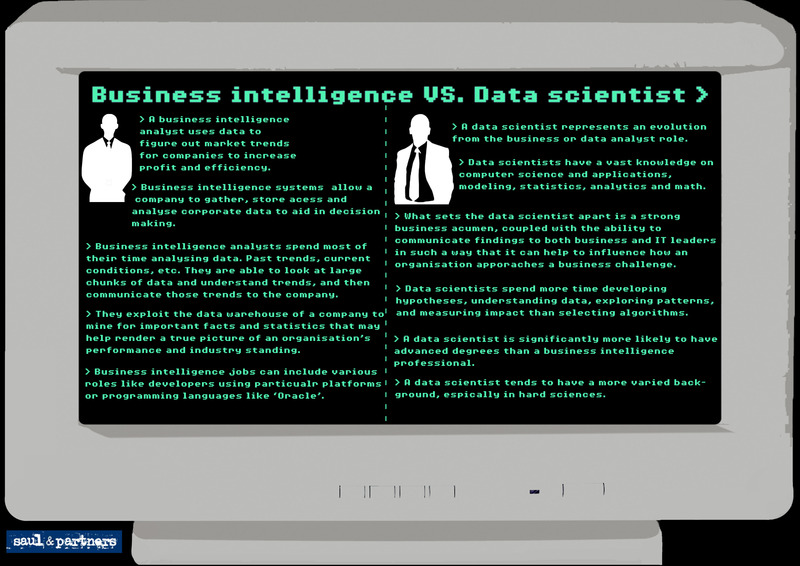 Though the roles are similar a Data Scientist is not a Business Intelligence analyst. Data scientists want to understand why something is the way it is, whilst a BI analyst wants to get to the right answer. A BI analyst provides guided analytics and answers what happened last week within the company- profits, sales etc. Whereas a Data Scientist answers more predictive analytics- what will happen the following week.